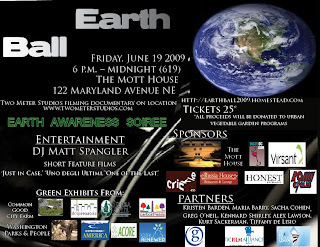 Casey Trees is going to the ball - EARTH BALL 2009. Members of the DC FOR OBAMA Advocacy Team on Energy & Environment decided to to take action on President Obama's plan to move green energy forward by organizing the 1st annual Earth Ball. The ball takes place on Friday, June 19 at the Mott House (122 Maryland Avenue NE). Doors open at 6:00 p.m. The goal of the Earth Ball is to promote and educate the public on the creative and innovative options available to reduce our energy dependency. How is Casey Trees involved? We are one of 15 organizations invited to participate in the ball's Green Exhibit Gallery. Our gallery submission shares a simple message - the average American generates 20 tons of carbon each year, an amount that can be offset by planting 2 trees each year. Commemorative Tree - request we plant a tree to honor a special occasion or person. We do all the dirty work for you. Remember when you add trees you help to offset and sequester carbon and move us one step closer to achieving our 40 percent tree canopy goal.